The Liberal Party gives a whole new meaning to “party”, there has been 16 instances where Abbott / Turnbull Government Ministers hosted extravagant parties and sent the bill to the taxpayer – to the tune of $15.4 million dollars has been uncovered by the Waste Watch Committee. An example of Abbott/Turnbull Government’s waste and extravagance is the former Treasure, now ambassador to the USA, Joe Hockey spent $20,000 on soirees during his 2-year tenure as Treasure. 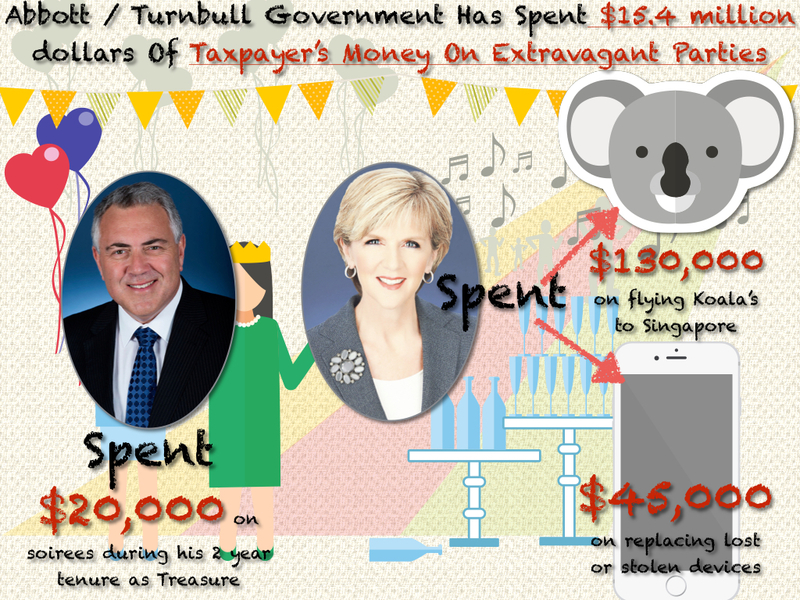 One of the most outrageous examples of Abbott/Turnbull Government’s waste is when Julie Bishop spent more than $130,000 on flying Koala’s to Singapore for a diplomatic event. Julie Bishop is a continual offender when it comes to waste of taxpayer funds, Foreign Minister Julie Bishop takes a tour each year with foreign ambassadors at an average cost of $55,000 per day and she always makes sure her entourage is on the guest list – even when they make up a quarter of the room at a $350 a head dinner. Her department has also spent more the $45,000 on replacing lost or stolen devices.